As is also often the case, once you pick up something new it seems to recur. One afternoon I left Francine shade-bathing for some R&R and went off to check out a nearby lake, the Lac de Balestié. 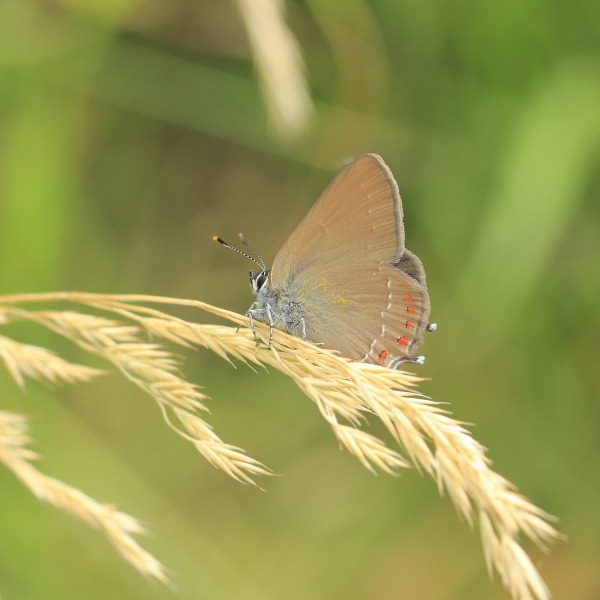 Though my main quarry was dragonflies, the first item that attracted my interest and had me stumbling across the rough undergrowth, was a butterfly. Oddly, it cooperated and I managed to snap it. It looked very similar to my new friend (above). This, though, was darker and the markings were slightly different with the orange spots being outlined in stronger black. 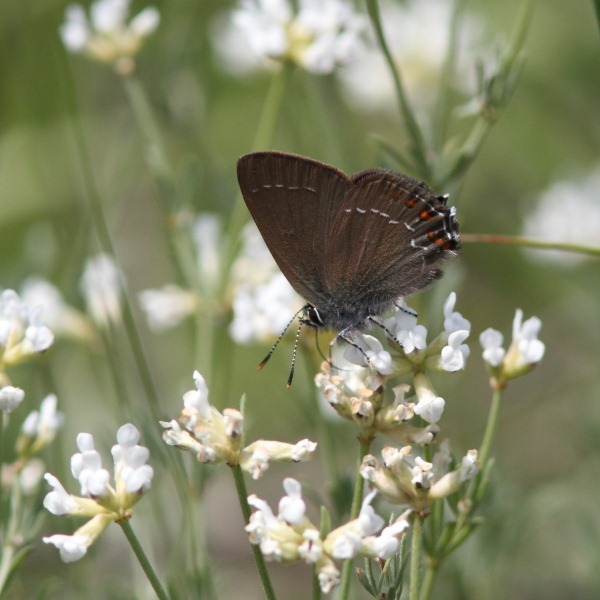 This was the (real) Ilex Hairstreak (Nordmannia ilicis). Now, with a comparison, I was more confident about my first identification. Excellent – a matched pair! Today, we went off on another potential wild Kees (pronounced “case”) chase. He had spotted some white orchids not too far from our campsite. Armed with his description of the destination, off we set looking along a section of road for “a high bank” on which, once we stopped, we would see white flower spikes. Surprisingly, we found it with little trouble. Well done, Kees! There was even somewhere to park, though I inadvertently placed Francine’s passenger door right beside a mud pool from the recent rains. She deftly avoided it and set off in search of white orchids. 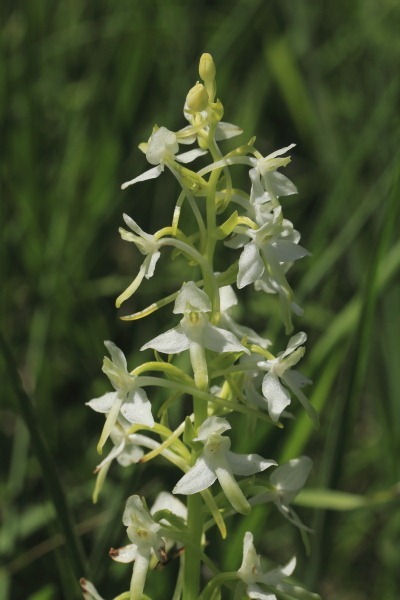 These delightful flowers – just look at the glittering petals of the close-up – are the Lesser Butterfly Orchid (Platanthera bifolia). Another new orchid for Francine and another very happy camper. As she was scrambling on the bank and snapping, I had returned to the car to move it slightly, trying to avoid the mud. 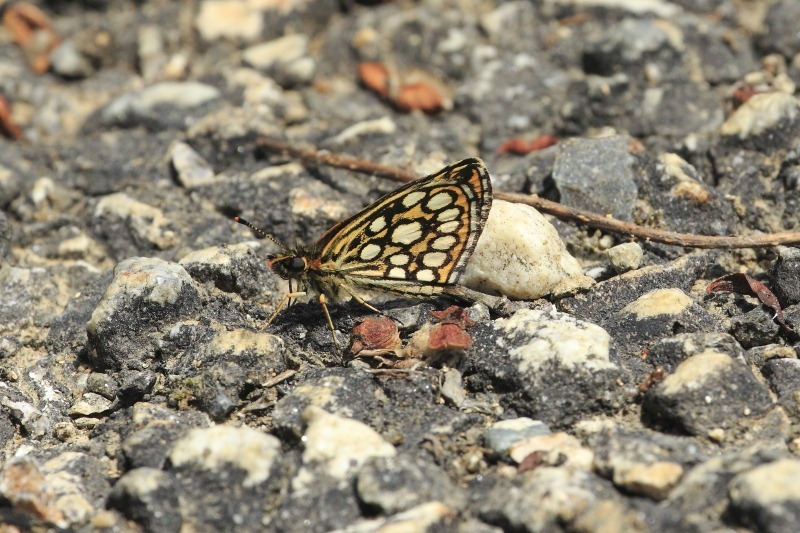 Another unfamiliar butterfly was flitting about drinking from the moisture of the mud pool beside the car. The underside of the hind-wing was strikingly marked and Francine, orchid shots in the bag, managed to snap it for me. This critter, whose existence I knew nothing about until today, is a Large Chequered Skipper (Heteropteus morpheus). Luckily, all three of these new butterflies sit with wings closed but it is the underside that is most photogenic. 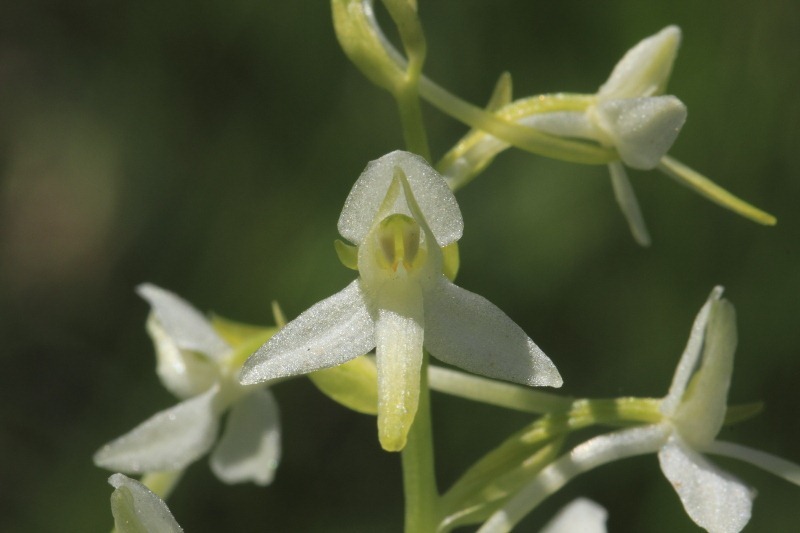 The new Lesser Butterfly Orchids – well, they’re just stunning.